The Eternal Rest is an inn that treats its patrons to a most macabre experience. Staffed by animated skeletons and operated by an eccentric necromancer, the inn provides a complete, ready to use setting when the game master needs to serve up a quick meeting place or overnight stay for the party without resorting to "just another inn." This 19-page supplement is suitable for any game system. It details the inn, its staff (both living and dead), and the unusual “regulars” found at the bar. The inn, the neighboring graveyard, and the catacombs-turned-private-rooms are all mapped in detail. 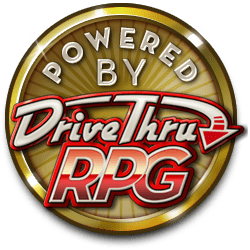 In addition to plot hooks seeded throughout the profile of the inn, several more adventure hooks appear at the end, and all material can be easily placed in any fantasy setting you might choose to play. The Eternal Rest can serve as a departure from the usual layover for adventurers, or it can become a base of operations for characters who like a little gloom with their drinks between quests. This product includes a second file, a printer-friendly version of the adventure that strips out the backgrounds to spare your ink/toner cartridges. Need a new face standing behind the bar? Take a look at Five Fantasy Barkeeps, Volume 1: Sources of Knowledge. Volume 1: Sources of Knowledge introduces barkeeps perfect for introducing special or unusual information. Images, descriptions, backstories, and personalities. Hooks to create instant relationships with PCs. Hooks to generate instant adventures for parties. Take a look at Five Fantasy Barkeeps, Volume 2: Suspicious Motives. 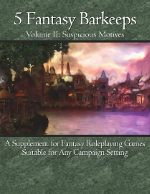 Volume 2: Suspicious Motives introduces barkeeps with secret agendas and things to hide.